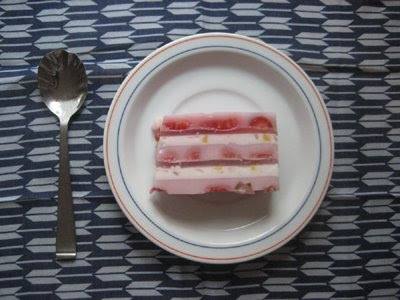 my cousin made a yummy gelatin cake with bits of strawberries, lychees, mango, and coconut. mmm, that looks so delicious! pretty tablecloth, and i love the apc madras dress! ooh i have that dress too! I love the check dress w/ the pocket - very cute. the gelatin sounds nice! cute dress. oh this looks so yummy and so cute! that looks & sounds so deliciously yummy!